Ethos worship night, Fall 2015 | Noche de alabanza y adoración, Ethos. Paintings after the worship night | Cuadros después de la reunión. I started this post over a month ago. 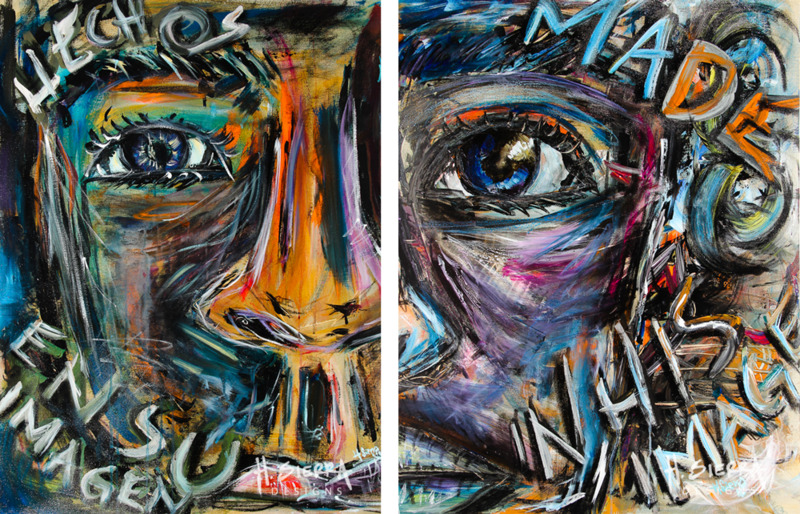 I worked on these paintings last fall, after painting at an Ethos worship gathering. They didn't feel finished, so a month ago I completed them. Throughout the process I decided to use larger brushes and bold strokes. I stayed away from major spatula work, but by using fixative between different layers I was able to add details with a washed out acrylic feel. To finish off and add more "life" and brightness I added a coat of glossy finish. I had seen what I thought was the face of Jesus, but that image shifted rapidly as the faces from people around the world moved rapidly in my mind. People with different features, different hair, different ages; but the face was one. 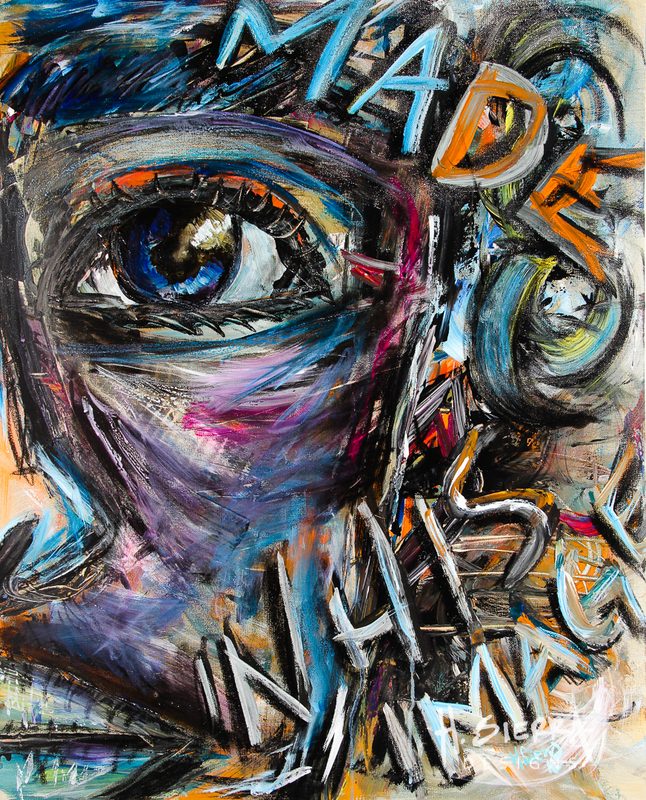 Imago Dei, "Made in his Image" or "Hechos en su Imagén". You see I do believe we were made in the image of God. The image of one true God, who loved us so much that He sent His SON to earth. Adding Charcoal weeks after the worship night | Agregando carboncillo semanas despues de haber pintado en la iglesia. I write this blog post on the eve of Easter, an important day to remember that Jesus rose from the dead. For some reason easter hasn't been a pinnacle moment in my celebrations or traditions. Why? 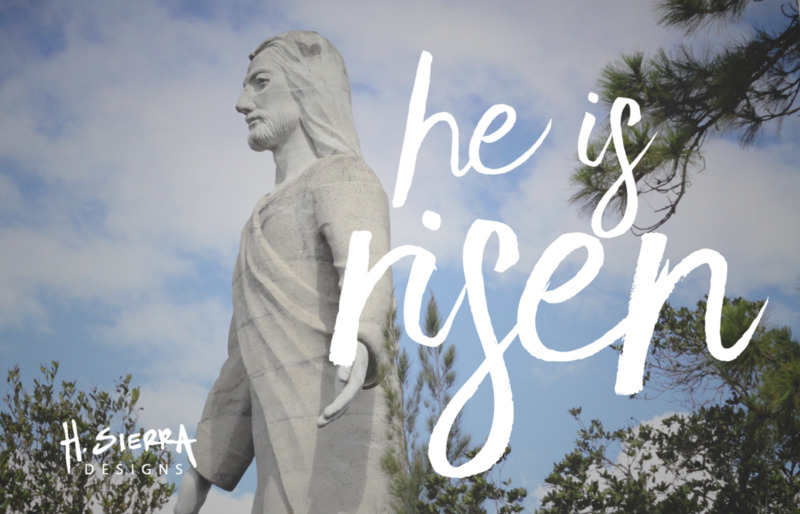 Because I grew up in a country that celebrates Holy Week (a.k.a. vacation time), so normally I would have been at the beach or near an area with a large pool, where all I did was swim for hours upon hours and I ate Mondongo (one of our traditional dishes, and a favorite of mine when my grandma cooks it). In college, I used to go to my friends' homes during easter break. Granted, eating chocolates and getting a basket or goodie bag, was a perk, but mostly these families celebrating being together. For some reason, the significance of the day didn't really hit me inside. This year, the fact that this day didn't have a larger significance bothered me a little bit. Not because of the fact that I'm not around my family. I have family everywhere I go. It jsut intrigued me that I didn't really reflect at a deep level what this day meant. Yes, we celebrate each Sunday and learn about who God is and worship him. But really we celebrate each week because of 1 moment in history, 1 pivotal moment in the life of a man, that occurred a little over 2000 years ago. This week not only was I think about this, I've been going back and forth on how I should present myself as an artist. Last Monday, I clearly heard the words: "I want it all", even your art & especially the areas where I don't fully trust God and want to control. The only reason why I'm a "Christian" is truly because someone gave up His life for me, and then rose from the dead to save me. On Monday, I was once reminded of that beautiful covenant and how I'm in a relationship with a God, where I desire the same. A relationship, in which I desire to give up the areas of my life that need to be transformed to look more like Jesus, because I was made in his image. We were made in his image. All people, and a day like Easter is significant because it is the moment of reconciliation between people and their Creator, the one who loved us so much that He placed a little bit of himself in all of us, and then when we messed it up he still loved us and then sent his Son to earth to die and rise from the dead: so we could be saved, reconciled, and experience a full life, a life of discovering and learning who God is. The prints and originals of this painting are available for sale.